European Corn Borer (ECB) and Corn Earworm (CEW) are significant perennial pests of many vegetable crops in New Jersey. Larval infestations of these highly destructive pests result in New Jersey growers applying approximately $862,800 of insecticides annually, or about $18.00 per treated acre to prevent economic loss. A variety of factors influence the severity of ECB and CEW infestations including winter/spring temperatures, summer weather patterns, and locate crop practices. Rutgers Cooperative Extension Vegetable IPM programs in sweet corn, bell peppers, snap and lima beans, lettuce and tomatoes use blacklight traps counts to monitor the activity of adult moths as an indicator of subsequent infestations of ECB and CEW young larvae, which feed on crops. Extension staff review the data and use this as one monitoring tool to assist growers in deciding to only treat fields with insecticides when ECB and CEW pests exceed economic damage thresholds. 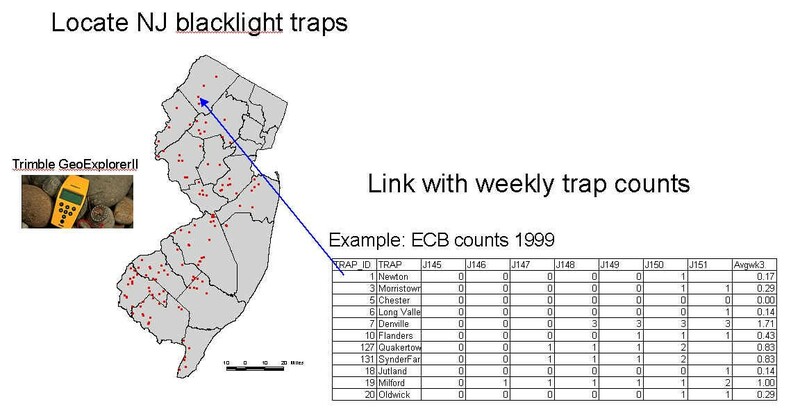 Dr. Donald Prostak initiated blacklight trapping in the 1970s at Rutgers and maintained a large network of more than 80 blacklight traps (see picture to left) throughout the state for 25 years. Because this information was compiled and archived, we can utilize new technologies in GPS/GIS to locate, analyze, and visualize the spatial distribution of ECB and CEW pests from the mid-1970s through today. Exact locations of blacklight traps were established using a handheld Trimble Geoexplorer IIGlobal Positioning System (GPS) unit (pictured at right) with 2-5 meter accuracy after differential correction. The traps were well distributed throughout the agricultural areas of the state. Blacklight traps were checked two times per week at three and four day intervals. Numbers of Corn Earworm (CEW) and European Corn Borer (ECB) in each trap were averaged for the duration of the sample. The trap counts were entered into an Excel database and imported into ArcView, aGeographic Information Systems (GIS) software package (ESRI, Redlands, CA) where the data were linked to the trap locations. The blacklight trap distribution is mapped on a base map. Weekly pest distribution maps based on this distribution map were created and disseminated to the agricultural community via a weekly plant and pest advisory newsletter available by fax, mail, and the internet. We have archived pest maps from 1999 through 2011. The entire pest map archive for 1999 through 2012 is browsable by year. You can also access the pest maps for the current week, as well as other sources of related information. Mapping the trap counts will serve as a useful tool for predicting where and when destructive pest populations are more likely to occur in New Jersey in future growing seasons. In addition, the ability to easily integrate pest maps with other spatially located data such as weather, will aid in predicting the likelihood of damage to a variety of vegetable crops, each having a unique threshold for pest damage. Visual presentation from GPS/GIS mapping may enable locating “hot spots” or frequent occurrences of these pests. This “data-mining” or gaining new uses from existing information makes it easier to extend IPM on more acres to more vegetable growers adjacent to trap locations who want to expand IPM practices in cooperation with Rutgers Cooperative Extension.